Reading strengthened their position in the Championship play-off spots as they ended Leeds' seven-game unbeaten run to leapfrog them into fourth in the table. 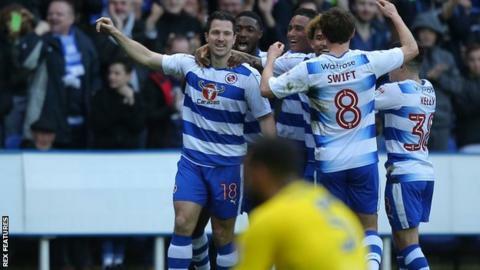 Yann Kermorgant's crisp first-half finish was enough to settle a game that the Royals could have won by more. Roy Beerens and Garath McCleary both went close to extending the hosts' deserved lead before half-time. Leeds had the better of the second half but failed to really test keeper Ali Al Habsi, and slipped to fifth. Victory saw Reading secure maximum points from key, back-to-back games against sides around them in the table, having won 2-0 at fellow play-off-hopefuls Sheffield Wednesday last time out. With Wednesday having slipped out of the top six earlier on Saturday with a 1-1 draw at Barnsley, Reading's win opened up a seven-point cushion between themselves and the now-seventh-placed Owls. Jaap Stam's side could have gone in further ahead at the break after Kermorgant had powerfully fired past Rob Green, but Beerens volleyed over and McCleary was denied by a good Green save when one-on-one. Leeds, who had not lost since 11 February and beat the Royals 2-0 in December's reverse fixture, improved after half-time but did not create enough in front of goal, despite a spirited effort. The visitors might have levelled before the break, but Pablo Hernandez could not quite connect at the far post with a terrific Alfonso Pedraza cross. Against the run of play, it was actually the Royals who had the best chance of the second half but an unmarked Beerens mis-kicked his effort when closed down by Green inside the area. "We're very happy with the performance, especially in how we played in the first half not just dominating possession, but in the chances we created. "We didn't finish them off in the first half, but we knew they would have to change their game after the break. "At certain times in the second half, we created a couple of good chances too, but we knew towards the end of the game they would be playing the long balls into the area to try and get that goal. "But we've seen it before, the boys worked hard to protect that lead and it's a big compliment to how they played. But for me, it's a bit stressful." "First half we made too many mistakes, uncharacteristically. We felt really comfortable defending against them. "But then we made four or five mistakes in that first half which really gave them their opportunities. Unfortunately, they took one of them off a mistake from us. "We made it into a game in the second half where we controlled it a bit more and put pressure on them and I'm happy with that performance. "Albeit, a little bit more luck and a little bit more guile and we could have got that equaliser and nobody could have begrudged us that." Match ends, Reading 1, Leeds United 0. Second Half ends, Reading 1, Leeds United 0. Garath McCleary (Reading) wins a free kick in the attacking half. Foul by Charlie Taylor (Leeds United). Corner, Leeds United. Conceded by Tyler Blackett. Attempt blocked. Kalvin Phillips (Leeds United) right footed shot from outside the box is blocked. Yann Kermorgant (Reading) is shown the yellow card. Foul by Yann Kermorgant (Reading). Foul by Jordon Mutch (Reading). Pablo Hernández (Leeds United) wins a free kick on the right wing. Substitution, Leeds United. Kemar Roofe replaces Ronaldo Vieira. Offside, Leeds United. Gaetano Berardi tries a through ball, but Souleymane Doukara is caught offside. Danny Williams (Reading) is shown the yellow card. Chris Wood (Leeds United) wins a free kick in the attacking half. Offside, Reading. Chris Gunter tries a through ball, but Yann Kermorgant is caught offside. Yann Kermorgant (Reading) wins a free kick on the right wing. Attempt saved. Ronaldo Vieira (Leeds United) left footed shot from the centre of the box is saved in the centre of the goal. Assisted by Charlie Taylor with a cross. Tyler Blackett (Reading) wins a free kick in the defensive half. Corner, Leeds United. Conceded by Ali Al Habsi. Attempt missed. Souleymane Doukara (Leeds United) right footed shot from outside the box is close, but misses to the left. Assisted by Pablo Hernández. Delay in match Reece Oxford (Reading) because of an injury. Reece Oxford (Reading) wins a free kick in the defensive half. Corner, Leeds United. Conceded by Lewis Grabban. Corner, Leeds United. Conceded by Liam Moore. Attempt blocked. Yann Kermorgant (Reading) right footed shot from the left side of the box is blocked. Assisted by Garath McCleary with a cross. Corner, Reading. Conceded by Robert Green.